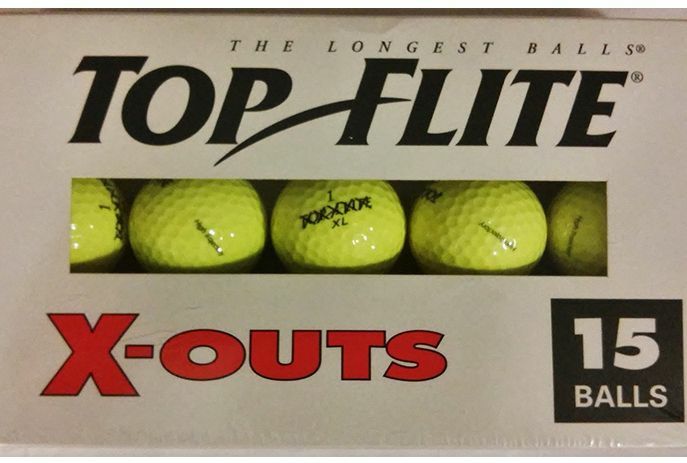 X-out golf balls are sold in some golf shops and retail stores in boxes with dull or plain packaging, and usually at steep discounts to "regular" golf balls. That's because an X-out ball is the result of a mistake in the manufacturing process: a cosmetic imperfection. The golf ball is sound, but because of the (often imperceptible) mistake in the cosmetics, the manufacturer removes the ball from its normal packaging. In "the old days," the name brand on the ball was typically stamped over with a row of X's, hence the term "x-out." Today, that is sometimes still the case, but alternately, several X's may be stamped near (but not over) the brand name. Or the term "x-out" might be printed on the golf ball. The term "x-out" usually appears on the packaging of x-out golf balls, or the packaging might describe the balls as something like "cosmetically blemished." Today, some manufacturers package the x-outs themselves, often into 24-count boxes, and sell them under the brand name, while making sure consumers know the balls inside are x-outs. As noted, the reason a ball is designated an x-out is almost always cosmetic; regardless, recreational golfers will not be able to tell any difference in ball performance compared to "regular" golf balls. Let's use Titleist for the sake of illustration. If during the manufacturing process some tiny little error occurs and the resulting balls are not up to Titleist standards, the company will not package those balls and try to pass them off as Titleist golf balls. But since the error is almost certainly just cosmetic, Titleist doesn't want to toss them out with the garbage either, because that would be a complete loss of money. So instead, Titleist stamps a row of X's across the "Titleist" name (or otherwise designates the ball an x-out), packages such balls in generic packaging and puts a cheaper price on them. Titleist still makes money, and many golfers get practice balls or play balls on the cheap. Are X-Outs Legal Under the Rules? The USGA and R&A maintain a list of conforming golf balls, and, according to the rules, only balls that appear on that list are "legal" in tournaments or at clubs where the Conforming Ball condition is in effect. Needless to say, x-out balls are not submitted by their manufacturers to the USGA or R&A for approval, and so they do not appear on the list of conforming balls. Therefore, if you are competing in a tournament or at a club where the Conforming Ball condition is in effect, x-outs are illegal for play. Does that mean that you can't use an x-out when it's just you and your buddies having a good time? No, it doesn't. And not all competition committees enforce the Conforming Ball condition, so it's possible that you might even be able to use x-outs in competition (if you're willing to be laughed at by the other competitors). X-outs are played mostly by beginners or by golfers on a strict budget. Better golfers never use x-outs for play but might buy them as practice balls. Do You Know What the Numbers on a Golf Ball Mean?